six in the city: take that Jillian! Nothing stresses me out more than moving. I'd rather go get my teeth scraped, picked and cleaned. As long as the dentist uses the laughing gas. I like that. Recently I've read about sedation dentistry, which sounds kinda nifty, too. I could use a good nap. Anyway, packing up a home is not fun. Anyone who says it is is lying. The things involved with a move keep my anxiety levels at an all time high. Add the fact that we're downsizing from a 6 bedroom home to a 3 bedroom apartment, and I should be making an appointment with a shrink. I'm edgy at times and can burst into tears at a moment's notice. I'm a blast to live with right now. Figuring out all the details to move to NYC hijacks my mind 24 hours a day. I've even dreamed about it- in between my dreams of super country star, Keith Urban. In my dream I'm at his concert and he picks me up on the stage and twirls me around. The he tells me I can touch his hair. I whisper in his ear, "I'm a southern girl." I know. Scandalous. But I have found a way to curb my stress. I eat. And eat. And eat. Sometimes I even eat while watching the TV show, "The Biggest Loser". I feel like I'm taunting Jillian when I do that. This small act gives me some twisted sense of control back in my life. I'm proving I'm not afraid of her. But the eating- oh the eating is getting out of hand. 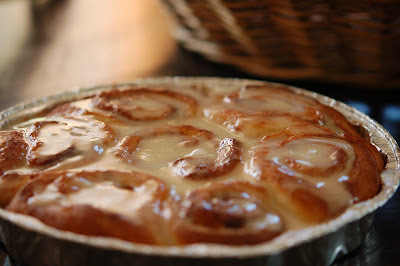 Last week I sent out a twitter that said, "I've fallen into a pan of cinnamon rolls and can't get out." But can you blame me? Look at these. If you'd like the recipe, so you can fall into your own pan, you can find it here. i understand the eat when stressed thing. believe me i do. i've always wanted to be one of those stressed out cleaning freaks. ya know, scrubbing walls...that sort of thing. not so. Hey! Just found the new blog officially today. I guess I read the first post, but didn't realize it was a new spot for you. Great work, I love the gang post. and also the blog title. Fun, fun. Thanks for letting me know you were here. I start hyper ventilating every time I think about you moving your family from our beautiful space to Manhattan... I find myself regularly having to take a deep breath... Wow.